Kids love soft and cuddly plush toys. They also love animals, so it makes sense that some of the more adorable plush toys available would be made as replicas of real animals. 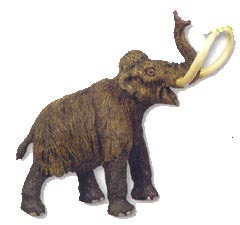 One of the different types of animals available include those designed as ice age plush toys, replicas of the animals that roamed the cold and icy Earth thousands of years ago in the Pleistocene Era, but now extinct. Usually, when children are interested in dinosaurs, they are also fascinated with these Ice Age giants, especially in light of recent animated movies. This line of toys includes a cuddly saber tooth cat, known as a Smilodon. The stuffed toy is made with a soft, plush outer material cut with short fibers to create a fuzzy texture. True to the saber tooth's character, it comes with elongated but soft fangs protruding from its mouth. Another cute creature available as one of the ice age plush toys is the rhino. During the Ice Ages, this animal had a much wider range that the rhinoceros of today, and were actually quite wooly and able to survive in the frigid climate, unlike the more tropical rhinos alive today. This cuddly animal is also made with a soft, plush outer material with a short cut pile. The rhino measures about eight and a half inches in length, with a body colored in gray and a single white horn protruding from its snout. The rhino is designed with a wide base as its feet so it can easily stand on a table or floor without falling over. The soft stuffing used to pad the animal's insides makes the toy easy to grasp for small hands and fingers. Children can pretend the rhino is charging up a mountain slope or grazing on the land. The best part about soft plush animal toys is their safety. Children can spend hours playing with these adorable creatures without getting hurt by sharp edges or hard parts. They can even take the toys to bed with them to snuggle with. The saber tooth cat is twelve inches tall and comes with separate front and back legs so kids can pretend the cat is walking along or stalking another creature. The cat also has a soft tail complete with a dark fluffy end to match its shaggy mane. This soft plush cat has a sandy tan body with a white muzzle and ears. These authentically reproduced stuffed animal toys, associated with the Ice Age, are licensed by the Natural History Museum. This means parents know the items they purchase are not only authentic replicas, but they are made with the highest quality materials. All of the prehistoric plush toys will appeal to kids who are interested in dinosaurs, kids who loved watching the animated series of movies or kids who love cuddly animal toys, with a history lesson about animals now extinct as a bonus. Most of kids like to enjoy picking things up and trying to pass them hand to hand. So we should give soft toys for them. Every new shape, color and sounds and texture is a learning experience for them.